Porcelain polychrome enamels of birds and flowers; lid with indentation; no handle. Lid does not match jar exactly. 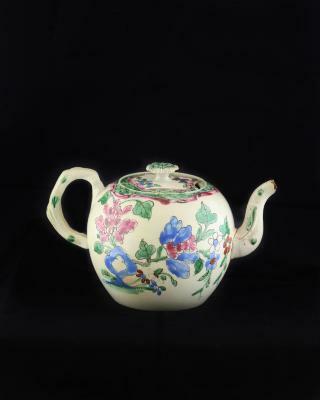 Floral enamel teapot without handles and round body with slender neck and spout. Symbol on bottom consisting of two squares, one inside of the other. 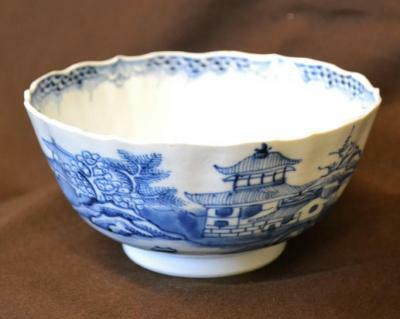 Bowl with a scalloped rim; decoration in deep blue; scenes of hills, trees, rocks, and houses. Twisted handle attached to pot by molded leaf and berry motif; floral sprays on front and back of pot; cover finial molded in shape of a berry. Porcelain sugarbowl with twisted handles on both sides attached to bowl by applied leaf relief glazed dark orange; no cover, although it appears to have had one; floral spray on front and back. Porcelain oval shaped tureen with twisted handles on each end attached with molded strawberry and leaf relief; decorative shield on both sides of cover; polychrome coat of arms on each side of lid. Two small salt dishes: pale blue-green color with floral design all around; rim of dishes is deeply scalloped with gold. Handleless cup of light turquoise background; inlaid with floral and swirl designs of pink, white, blue, yellow and green; white bottom with thin brown line at base, white interior. Porcelain cream pitcher with four reserve panels separated by bands of gilded rococo scrolls on white ground. Symbol which looks like two crossed swords on bottom. Porcelain ceam pitcher with four reserve panels separated by band of gilt scroll; two panels are white grounds with figures and landscapes; the other two panels are aqua ground with floral sprays. Porcelain polychrome fruit and flower decoration; twisted handle; gilt scrolled band around interior edge. Symbol which looks like two crossed swords on bottom. Porcelain saucer with fruit and flower polychrome decoration; gilt scrolled band around interior edge. Symbol on bottom which looks like two crossed swords on bottom. Earthenware (creamware) plate with molded rim with rust outlines; black classical figure and heraldic lion painted in center, surrounded by scroll and floral motif. The artist is possibly John Turner. Two eight inch plates, purple over-glaze decoration in floral motif made of soft-paste porcelain. Part of a complete tea set. Possibly a Minton set. Creamer, purple over-glaze decoration in floral motif, made of soft-paste porcelain. Possibly a Minton tea set, but there are no marks. This creamer is part of a larger tea set (01.22-01.26). Round waste bowl with stand, purple over-glaze decoration in floral motif, made of soft paste porcelain. Part of tea set (01.22-01.26), possibly made by Minton. Cup with saucer, purple over-glaze decoration in floral motif. made of soft paste porcelain. Part of a larger tea set (01.22-01.26) possibly made by Minton. Sugarbowl with cover; polychrome over-glaze floral and leaf decoration in plum, bright green and blue, made of soft past porcelain. Part of a tea set (01.27-01.31) possibly made by Minton. Teapot with lid; polychrome over-glaze floral and leaf decoration in plum, bright green and blue made of soft paste porcelain. Part of tea set (01.27-01.31) possibly made by Minton. Two dessert plates; polychrome over-glaze floral and leaf decoration in plum, bright green and blue made of soft paste porcelain. Part of set (01.27-01.31) possibly made by Minton. 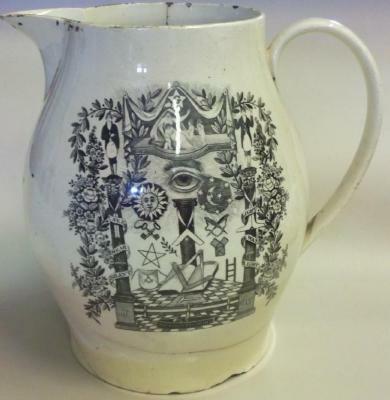 Liverpool type Earthenware pitcher which has three black transfer printed Masonic emblems on front, back, and under spout. Once owned by Miss M.E. Powel.